The log cabins are built from dried 3”x 6” milled double tongue & groove (t&g) spruce logs. Built with an R-20 insulation filling, which will reach a total R-25 insulation value for the outside walls. This method will meet and even exceed the new energy efficiency requirements of the National Building Code. View our log cabin description page for more general information about our cabins. 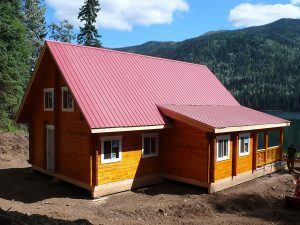 For more information and PRICING click on the cabin images below. Each plan includes a description, sizes and pricing.